Gear used on the Vålådalen trip had one thing to cope with: Water. From above, beneath and the sides, it was wet all the time, and up in the fjell also the wind was very strong - good conditions to see if the lightweight kit I took can stand these conditions. For starters, have a look at my complete gear list. 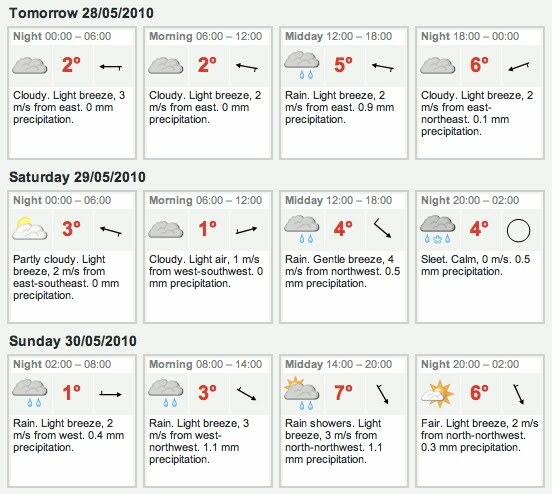 Weather forecast for our trip. My LAUFBURSCHE huckePACK performed as I expected it to perform - excellent. Bushwhacking did nothing to the material, which kept the rain out and the stuff dry inside. Plenty of space for food and gear for a week. Love it. My GoLite Ultra 20 quilt kept me warm and comfy at night, and as it got slightly moist it was easily dried at the campfire. For summer tours I will stay with quilts, no doubt. Sleeping mats: Mulitmat Adventure & six segments of a Therm-A-Rest Z Lite made for very comfy nights. They function also as a frame and backpanel for my pack, so serve double duty. I can't forget them thus and they also can't break. Shelter: I continue to use the Gossamer Gear SpinnTwinn and really like it. Easy to set up and to fine-tune, plenty of space and great protection from wind and rain. 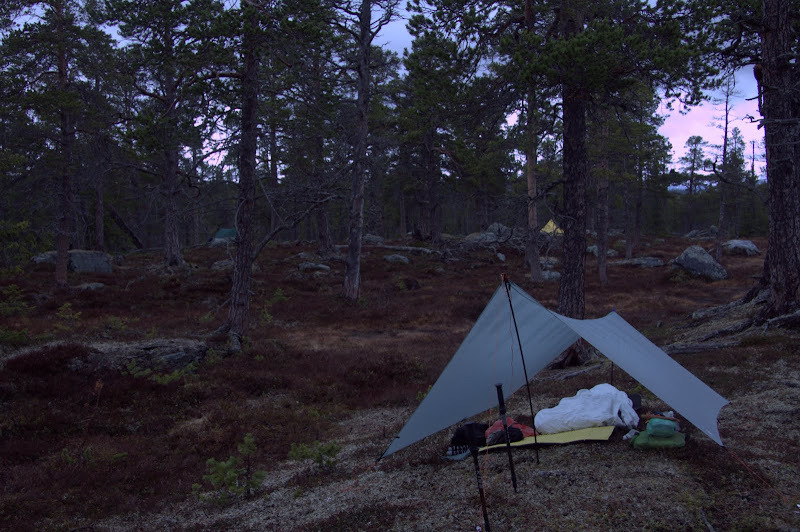 I'd feel comfortable to pitch this on the fjell on a rainy and windy night if need to. Review forthcoming. Bivy: A LAUFBURSCHE tyvek bivy is my bivy of choice. Tyvek is super breathable and under a tarp I don't need much more protection from wind and water. Review forthcoming. Shell clothing: No surprises here, I continue to use the Rab Momentum jacket and Drillium pants and think they're ace. Dry and protected from wind while walking up hills is all I need. And they dry quick after fording as well. Base layer: Also no surprise, Woolpower long johns and longsleeve keep reigning supreme. Kept me warm in the wind and at night, without smelling. The socks also were excellent, great cushioning and warm feet, even when fording ice cold rivers. Shoes: Inov-8 Mudclaw 330 were the shoes I used on this trip, and they were great for the conditions we experienced. Great grip in the mud, rock, forest path and riverbeds, though on overflooded duckboards they were a tad slippery. Maybe I like the sole of the Roclites a bit more. Review forthcoming. Camp & Sleeping wear: Because I knew it was going to be wet I took the Montane Fireball Smock to wear it in camp around the fire, and I continue to like heaps. 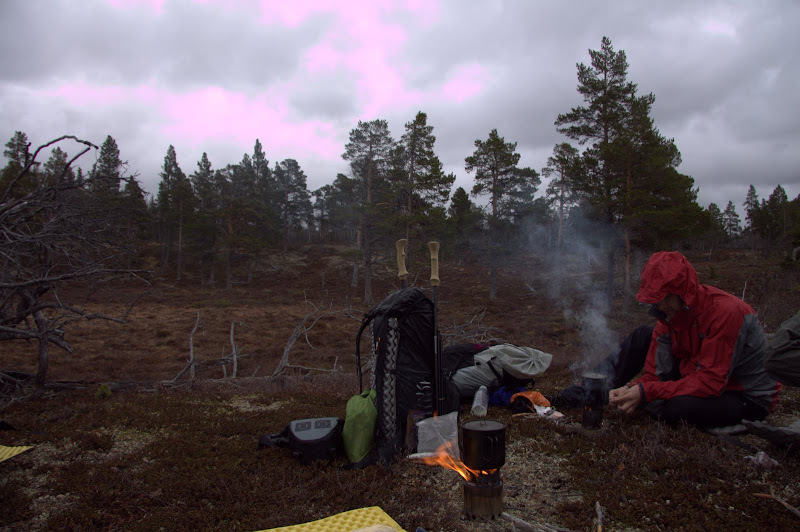 It is light and takes minimal space in my pack, and has no problems with the rain & wetness we were constantly in. To bed I wore the Klättermusen Loke, as downy goodness from Sweden with a hood is what lets me sleep tight at night. Really like this garment, review forthcoming. Kitchen-wise there were the usual suspects: BushBuddy Ultra and Tibetan Titanium 1100 were used for cooking, and now my fire-making skills are so far that I also feel comfortable to use it in the wet conditions we had. LMF Firesteel, puukko, kuksa and a LMF Spork were used for eating, cutting and drinking, and I continue to find them excellent. Food wise I had an assortment of cereal and chocolate bars for quick energy on the trail with me, corn spaghetti & chili tomato sauce as well as polenta for lunch and Real Turmats for dinner. Dessert was a finnish organic blueberry "kissel" and the obligatory Minttu cacao. Real reigns supreme in the ready-made sector, while the corn spaghetti and chili tomato sauce was ace. I had a Spanish chorizo sausage with me for that high-energy fat, which was delicious. All other small stuff - first aid, gloves, buffs, mitts, socks, platypus, compass et al worked without problems and I will review a couple of the items when I find the time. To conclude, I felt warm, save and well-fed the whole trip despite the rain. With 1863 g for the big three (Rucksack, shelter, sleeping system) I was the lightest of us six, and including food for three full days I started with 6547 g on my back. I see no need to carry more than that, and think it could even be pushed lower if I would switch some items.